One of the first steps in the process of becoming a police officer is passing a background check. After all, officers are some of the most well-vetted employees in the job market, with a process that can take up to six months before candidates even reach the academy. By following the H.E.A.T. approach for police applicants - focusing on honesty, being easily accessible, alert, and ensuring thoroughness - during the background investigation process, applicants will find that this step can run smoother and faster. Applicants without these issues may still have many questions about passing a background check - questions involving marijuana use, misdemeanors, credit score, and even tattoos. Getting through the background check is certainly nerve-wracking, but leading experts including background check technology firm KENTECH recommend applying the H.E.A.T. method of approaching the process for optimal success. As noted above, the H.E.A.T. 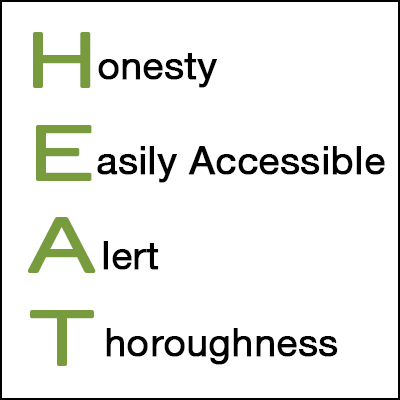 acronym stands for Honesty, Easily Accessible, Alert , Thoroughness. Approaching the background check with these three guideposts as a mindset prepares an applicant to successfully meet the requirements of this process. Mistakes happen, and everyone makes them. But for job applicants, and especially candidates for law enforcement jobs, it's critically important to answer questions about the past with honesty. Very few things are as damaging to the career of a law enforcement officer, or a potential law enforcement officer, than the act of telling a lie. For officers, total credibility is just as critical a component of the uniform as the badge and the gun. Therefore, complete and candid disclosure during the background check process is step one in what could become a career of spotless honesty. Prospects caught lying during the application process - including the background check -will not get hired, period. Applicants with questions regarding what may come up on a background check can take steps to prepare. Running an independent background check before going in for the official version is easy enough to do online this day and age and allows for preparation before going in for the official version. At the end of the day, candidates who come clean about less-than-pleasant information are generally viewed as having integrity. While integrity isn't a ticket into the academy, handling things in this manner is undoubtedly the right thing to do and is a benefit to the applicant's character. Considering that the hiring process can be lengthy, it's not unusual for applicants to be less than responsive when investigators or the department finally do follow up to take next steps in the process. Certainly, it is expected that prospects have other responsibilities, but it is important to also convey that this is an important opportunity. In order to proceed, applicants should respond promptly and thoroughly to each request for contact and information received. Not only does this demonstrate responsibility, but it is also a test of the prospect's communication skills on a move-forward basis. Communication skills are the most important tools in a law enforcement officer's repertoire, and this is a key opportunity for applicants to show off their prowess in this area when interfacing with interviewers. Many times when an investigator does not receive a response from a candidate after contacting, they may put the candidate's file on hold or mark the candidate as non-responsive. This can lead to disqualification. Therefore candidates must remain alert at all times during their investigation as their investigator may have a series of follow-up questions after your initial interview. Remain alert for your investigator's phone call or email. The final maxim of the H.E.A.T. approach deals with taking a complete approach to personal information: It's essential to be honest, but also to be honest completely and longitudinally. In other words, in order to be fully transparent, that transparency must extend throughout a candidate's life and in all areas - professionally and personally. Also, ensure all necessary documents have been remanded to the correct personnel. William Harvey writes in Police Magazine online that a colleague of his lost a job because of a spring break arrest three decades previous. Harvey also cautions applicants against health-food detox remedies to purge traces of drugs; online lie-detector cheats; and crib notes for psychological tests. What does Harvey recommend instead? The truth, the whole truth, and nothing but the truth. Due to their position of primary importance in society, law enforcement officers are among the most thoroughly vetted job-seekers in the nation. Protecting and serving the public demands takes a special breed of person, one with character and judgment who's also capable of withstanding rigorous training - but don't let the size of this responsibility stop you from contending to become a top choice candidate when submitting a law enforcement application. By bringing the H.E.A.T. - following the H.E.A.T. approach for police applicants - during the background investigation process, there is a strong possibility of being chosen by an agency to take the next step of reaching your goal as a sworn officer of the law. For law enforcement agencies, KENTECH provides complete and speedy reporting on top candidates. The company's High Tech High Touch™ approach already has a proven track record of success. To partner with KENTECH, contact hiremore@ekentech.com.